Made for Yoga and Pilates enthusiasts as well as barre exercises and dance activities, the ToeSox Full Toe Bellarina Grip socks ensure all the needed feet support and comfort due to arch band as well as exceptional non-slip grip pattern on the sole for maximum stability and traction during barefoot exercises and movement. The fitted heels keep socks in place without twisting and huddling, whereas the five-toe separated design ensures freedom of movement for naturally enhanced dexterity and comfort. These socks are made from a blend of 90% cotton; 8% spandex 2% other fibre, plus they look brilliant and moreover deliver an excellent cosy fit. Five toe natural movement improves stability and dexterity for enhanced performance. for submitting product information about ToeSox Full Toe Bellarina Grip Socks We aim to answer all questions within 2-3 days. 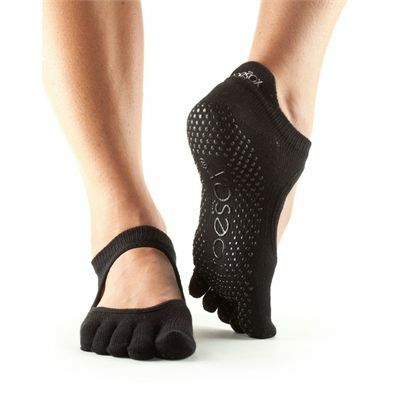 for submitting product information about ToeSox Full Toe Bellarina Grip Socks. We aim to answer all questions within 2-3 days. If you provided your name and email address, we will email you as soon as the answer is published. for submitting product review about ToeSox Full Toe Bellarina Grip Socks.